I stumbled upon this great read quite by accident, I picked it up thinking it would interest Josie age 10- who seems to be between books right now...She hasn't picked it up yet, but I did- and wow, what a cute/fun/sweet book. This is homeschool family read-aloud-fun, people! 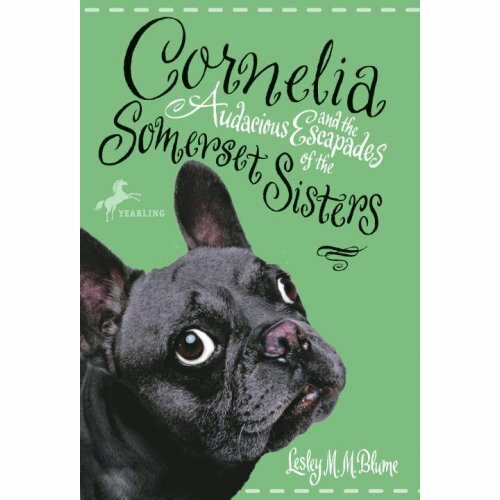 Cornelia and the Audacious Escapades of the Somerset Sisters by Lesley Blume is listed for grades 4-6 or 5-7, but I think it would have a wider interest range as a read-aloud. "Notice I didn't say that story endings should be tidy, Cornelia," she added solemnly. "Very few stories have tidy endings, or entirely happy ones. But a story can have a positive ending without it being wholly happy." That is exactly the sort of ending this story has. It was a really fun, witty and satisfying read that just begs to be read aloud, specially the French parts. The next time you go to say "what? ", you just might find yourself asking, "comment? ", and you will always think of French china and chiens together and have to laugh. Put it on your next read aloud list, you won't be disappointed.